The San Luis Coastal Unified School District is abandoning its plan to build an 88-unit residential complex on Johnson Avenue — instead vowing to seek a smaller project. The project raised considerable opposition from nearby residents concerned about traffic impacts and the size of the development in a neighborhood of single-family homes. Designed as seven three- and four-story buildings, the complex called for 14 one-bedroom and 74 two-bedroom units. The draft environmental impact report, released Jan. 24, detailed significant traffic impacts to nearby Lizzie and Buchon streets, which are already plagued by traffic. The school district would be required to pay for a large portion of the road improvements needed to mitigate the additional traffic caused by the development, including a possible roundabout at San Luis Drive and California Boulevard. 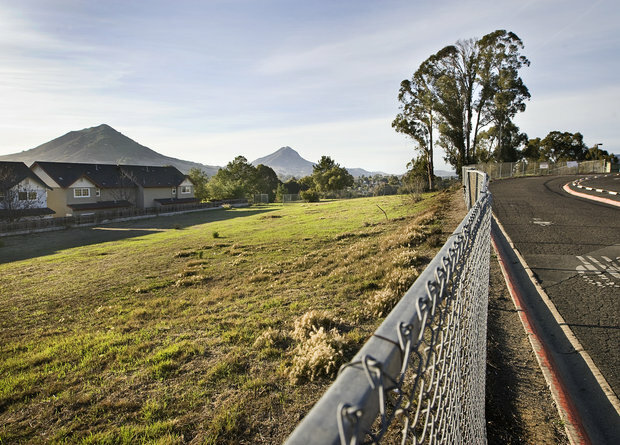 The 4.4-acre hillside property is south of the San Luis Obispo High School parking lot and east of San Luis Drive and Johnson Avenue. The only vehicle access to the site is by Fixlini Street. Pinkerton said a new plan for 35 lots or fewer for single-family homes is now being discussed. The amount of money it would take to make the necessary improvements for a larger project would minimize the financial gain by the district, Pinkerton said. Pinkerton will take several options to the school board in coming months. Ultimately, the trustees will decide what type of project the district wants to pursue. Eric Meyer, a former city planning commissioner who lives nearby, was adamantly against the original project because of its density, instead vocalizing support for single-family homes with possible granny units. Resident Lanny Hernandez, who lives nearby on Wilding Lane, created a website to keep other neighbors aware of the project. A smaller project would likely win the support of the neighbors, Hernandez said. The city held a community meeting Jan. 30 for nearby residents to provide information about the EIR and traffic impacts of the then-88-unit proposal. Nearly 100 people attended, and most left angry because of the meeting’s format, which many people called inefficient, confusing and useless. City staff stood at small tables to address specific concerns such as traffic, but the room was too small for the turnout, making it impossible for most people to navigate. Resident Jerry Schwoer, who lives on Woodland Drive, came to the meeting because of concerns about additional traffic on Lizzie Street. “I expected an overview presentation of the traffic study and a discussion of how the issues might be dealt with. Instead, I got a lot of confusion,” he said as he left the meeting. The project’s history spans eight years. The property, owned by the school district, was deemed as surplus in 2006. School administrators began looking at the property as a way to add additional revenue to its cash-strapped general fund. In 2008 the district submitted plans to the city for 14 high-end single-family homes. However, that plan changed as the property became identified by the city as a potential area for high-density housing to help fill a void of affordable housing. Two years later, in February 2010, the school district submitted plans for the 88-unit, seven-building residential development. The city’s Planning Commission was scheduled to discuss the draft EIR on Feb. 26. That discussion has been postponed as the district decides what it will do next.